The images below depicting The Binding of Isaac and The Meeting of Abraham and Melchizedek may be unique to St. Mary's but they are not unique pictures created by Jozef Mazur. Instead, they are adaptations of two works by another artist. As you can clearly see, the positions of each character within the mural is depicted in the same position. However, there are some distinct differences. Specifically, the facial features of each character are much softer in those of Mazur's works. In the case of Melchizedek, the great number of Abraham's followers are not depicted in Mazur's mural, instead an altar is present. The above work does not include a chalice, which is present in the Mazur work. Mazur remains in line with the traditional depiction of this scene as The Meeting of Abraham and Melchizedek is considered the foreshadow of the Eucharist. So, if Mazur didn't create these two scenes, who did? The answer is Julius Schnorr von Carolsfeld. 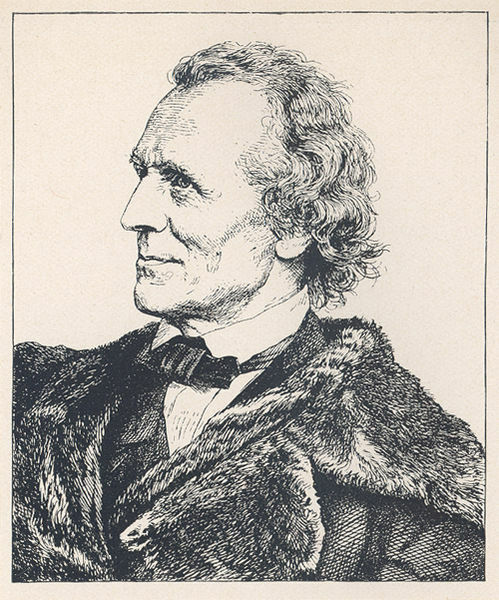 Julius Carolsfeld was born at Leipzig on March 26, 1794, the son of an engraver and painter named Johann Schnorr. Carolsfeld's work is often broken down into three periods, the first two concentrating on secular works while the third focused on biblical subjects. These specific works were woodcarvings, including the two used by Mazur for the murals in the sanctuary at St. Mary's. There is no need to go indepth at this point concerning Carolsfeld, but perhaps a section could be designated to him later describing his other works which cover both Old Testament and New Testament events. The Binding of Isaac represents God's testing of Abraham's obedience; to make a burnt offering of his son Isaac. Upon reaching the place where Abraham was to make his sacrifice, Isaac carried the wood to make the altar fire. 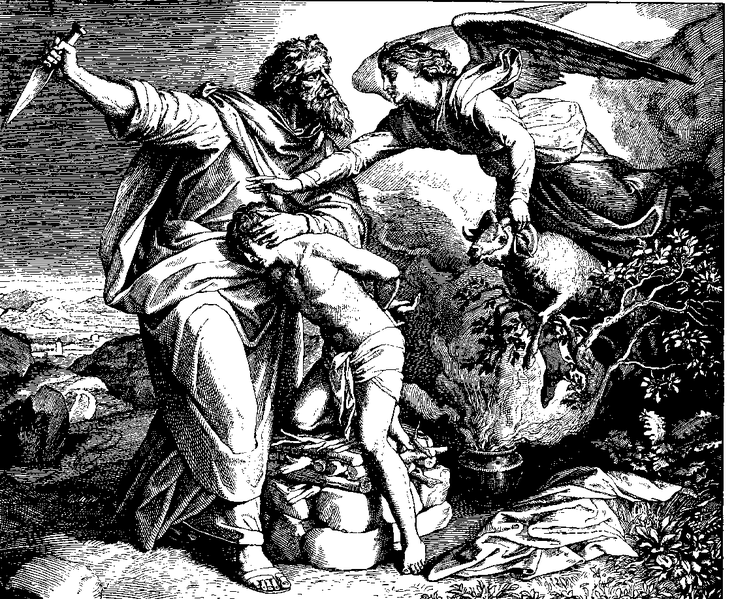 This image depicts Abraham drawing his knife to sacrifice Isaac. The angels is moving to stop Abraham, his Biblical line, "Now I know that you are a God-fearing man. You have not withheld from me your son." Traditionally, the ram depicted here is usually stuck in the bush and the angel is pointing to the ram. Instead, this image shows the angel grabbing the ram by the horn, to show Abraham that he is to sacrifice the animal and not his son. This image is in the likeness of traditional depictions. The ultimate symbolism shown within this image is Obedience to God. It is not surprising that such an image, reflecting obedience to God would be located in a church. However, this painting is the last remaining mural of this subject painted by Jozef Mazur. Any other murals of a similar subject have been painted over or removed. This mural is of a scene which is not frequently depicted in churches. After Lot and Abraham returned from Egypt, they parted ways and Lot settled in Sodom. When raiders attacked the Cities of the Plain, he was captured. Abraham armed three hundred men, attacked the raiders by night and defeated them. Abraham returned to Salem (Jerusalem) and was greeted by Melchizedek, the high priest and king. Melchizedek offered bread and wine in blessing of Abraham. The traditional representation is similar to the image in St. Mary's. In the piece by Carolsfeld, there is the absence of the altar and chalice, while numerous men are visible around Abraham and Melchizedek. Here Melchizedek (left) holds his hands up in praise. In this image, his crown is absent but is present in the depiction by Carolsfeld. This most likely is to emphasise his role as the high priest and not so much as king. The image clearly is a representation of the Eucharist. Medieval depictions of this scene were meant to foreshadow the Eucharist as this was an Old Testament event. However it can be, upon a closer look, a representation of the plight of the Polish Immigrants; welcomed from a long journey, blessed and welcome at the altar.